It only took decades upon decades of stories, movies, TV shows, and video games for humans to take a stand against the Killer Freakin’ Robots that won’t be programmed to sing and dance upon humanity’s grave, but they’ll do it anyway. In April, the “Stop the Killer Robots campaign” will launch at the British House of Commons, brought together by a globally conscious group of notable academics, Nobel Peace Prize laureates, and others who hope to reach a worldwide agreement to take preemptive action by banning the use of autonomous robots, such as drones, in wartime. With technology advancing far beyond the paperwork that’s supposed to guide the laws and morals behind that paperwork, drastic steps need to be taken in order to avoid a rise of the machines. And not just because of Nick Stahl’s John Connor. The group is hoping for results similar to the actions taken against cluster bombs and landmines. Make love, not war-crazed automatons. Not every robot in the world needs to be sleek, shiny, and full of gun turrets in order to be badass. Sometimes the goofiest-looking bots are the most impressive, due to the ideas and craftsmanship involved. And, of course, goofy robots have far less of a chance of destroying humanity, so it’s pretty easy to hop on their bandwagon. Nothing is hopping in the video below, but there is some walking involved. Four Russian robo-thusiasts who call themselves Konstantin Ivanov created a walking ostrich robot using only $1,500 worth of wood, electronics, and ingenuity. Presumably vodka was also in the mix, guiding their decision to model the robot after an ostrich, instead of one of nature’s more vicious birds, like the peacock or titmouse. I make fun, but this huge chunk of mobility is quite a sight, and I’d be honored to own one as a pet. While I freely profess the damnation and death of all humans will come at the bionic hands of robots, I am fairly close to being able to admit that not all robots will be complicit in our downfall. AutoMeeS recently released a smartphone and tablet-cleaning robot, and I don’t think that little guy is going to be taking over anything any time soon. And I rather enjoy the recent upswing of robots standing in for children who are unable to make it into school, though these will obviously be the brains behind the Robot Revolution. You take the good with the bad, I guess. 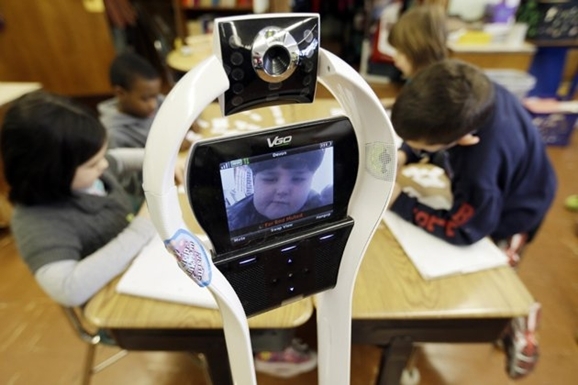 Seven-year-old Devon Carrow is the latest to use the VGo telepresence robot to remotely attend school, which in this case is Winchester Elementary in West Seneca, NY, a school that accepted young Devon’s robo-student where other schools had balked at the robot’s camera for classroom use. That’s what having George Orwell on the reading list will do to people. The Human Advantage going into the unavoidable future war with the robots is well on its way to extinction, thanks to all those silly humans who call themselves scientists that are just building a bravado-soaked house of cards, where one-upsmanship will act as the catalyst in our inevitable downfall. Oh, dammit, while I was loudly doomsaying, a swarm of robots got in here and murdered everyone else. I’ve lowered my voice to a monotonous whisper for the rest of the story, since Australians Matthew Dunbabin and Ashley Tews, of the CSIRO Autonomous Systems Laboratory in Brisbane, have created a robot that functions mostly by using sound detection to assure its actions go unheard. The as-yet-unnamed four-wheeled robot is fitted with a camera, laser scanner, laptop, and a sound pressure meter. And when these powers combine, you have Solid Snake-bot that uses sounds and background noise to cover its tracks, predicting how long and how often the sounds will occur, and sneaking around when it knows it won’t be heard. If you’re in a silent room having a cell phone conversation with your mother, and you have pissed off the Robot Army enough that they’re sending someone to “take care of” you, that robot can foresee your side of the conversation by guessing the frequency and length of your responses, and only creeps up behind your back during those times. The robot also knows its own noises, and can gauge how they change as it goes faster or slower, and when turning around corners. It can tell how its sound is perceived from 150 ft. away, and adjusts itself accordingly. The laser scanner allows it to find and utilize shadows or other quality vantage points as it advances upon its prey. So quit hogging the conversation the next time you talk to your mother, let her get a word out or two every now and then. For a BBC 4 documentary entitled How to Build a Bionic Man, airing on February 7th, social psychologist Dr. Bertoit Meyer is presenting Rex, a six-foot-tall man made completely from artificial and bionic limbs and organs. 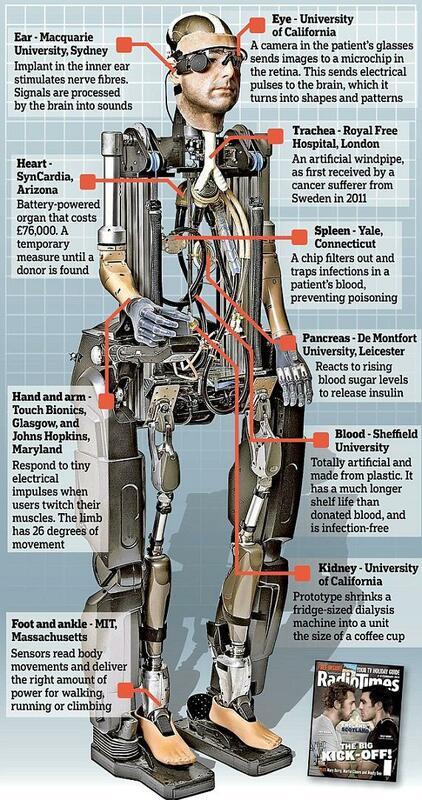 Rex, which stands for “robotic exoskeleton,” was built by U.K. roboticists Richard Walker and Matthew Godden, who sourced the state-of-the-art body parts from England, Australia, and all over the U.S. The final tally for costs came out to around $1,000,000. I wonder if they got the money out of a bionic piggy bank. The amount of common sense that tells a person not to stick a group of spiders in the path of an Enlargement Ray is the same amount that should keep that person from giving a robot a chainsaw. Luckily for all of mankind, this robot appears to be geared towards carpentry instead of creating a planetary massacre. For now. German designers Tom Pawlofsky and Tibor Weissmahr, both of the Karisruhe University of Arts and Design, gave a robot a chainsaw and told it to make furniture. Specifically, Pawlofsky designed the nameless robot to perform its chainsaw wielding with precise accuracy, while the pair conceived the look and process of creating the finished product, which comes out to be a couple of stools, called 7Xstool, and a nice little table or two. Made from real wood, right in front of your eyes, with only sawdust left behind. Check out the robot in action, and try not to be bothered by the ominousness of it not having a name.